Bodybuilding is a fantastic sport that if tackled in the right way and without the rush for getting quick results, could result in a spring of satisfactions for most of the athletes. Alas very often it is depicted as a "dirty" sport, mainly from mass media or people who have not the slightest idea about the shape of a barbell or a dumbell. You see, that's what often happens in football tv show in which people who have never kicked a ball in a pitch talk like experts about the ... void. I will always remember one of those a dime psychologist referring to bodibilders as frustrated narcisus unsatisfied with their bodies. Funny that the guy had such a huge tummy that I bet he could not even be able to lace up his shoes. That guy was perhaps missing the point of the human evolution: the crave for self improvement. As far as the health of the body cannot be parted from a healthy mind, it goes without saying that keeping both mind and body in perfect shape is the main goal of any human being. There is no need to feel ashamed about the idea of wanting a better shaped body. Any sport that could improve our health and the functionality of our body should be, in my humble opinion, be always welcomed. Bodybuilding is certainly not the best of sports but, if it is practiced in safety, it will make our body change in better, keeping the fat/lean mass ratio at its minimum. All above has of course nothing to do with what is done by Pro Borybuilders. 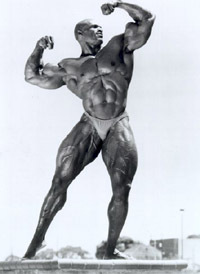 Anyone thinking that working-out in a gym will transform his body in the same as Ronnie Coleman is just daydreaming. Uncommon genetics, huge loads of steroids, testosterone, GH, insulin, ephdrine make monsters of these "champions" ... who do not certainly deserve our jealousy. Natural Body Building is a tough sport that needs a complete turn in ones habits. Of course all the sacrifices will gain the athlete the rewards he is looking for and for sure all the pain will worth the benefits of a better health. Be reassured that the stack of pain I am writing about has nothing to do with going to the gym six times a week... just the opposite! Nevetheless a few conditions must be satisfied in order to succeed, conditions that are really hard meet mostly at the beginning, but, step by step, if you stand your ground, all the basic rules itemized below will be very easy to fulfill. Perfect execution ot the exercises! Your aim is to increase your strength, all the rest will soon or late follow. Know exactly what you are going to eat tomorrow! What said above suggests that the hard work is to be done out of the gym. Giving up the Saturday night beer with friends and smoking or going to bed earlier enough to recover completely is for someone a real ordeal.